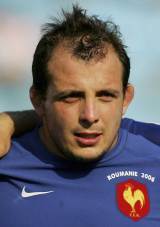 Attoub began his career with Valence Sportif, representing the side between 2000 and 2003 before joining Top 14 heavyweights Clermont Auvergne. While at Clermont Attoub was called up to the French squad and was named as a replacement against the USA in 2004, although he failed to make his Test debut from the bench. In 2005 he again moved, this time to Castres. A Test debut against Romania followed in 2006. Attoub left Castres for Paris and Stade Francais, but was hammered with a 70-week ban for gouging in 2009. His offence, against Ulster flanker Stephen Ferris, meant a mammoth sanction and exile from the game until 2011. But after impressing for Stade Francais on his return from the ban, Attoub found himself back in the reckoning for the 2012 Six Nations after being named in the 23-man squad for their opener against Italy.